Projector Lamp Experts is the number one choice for replacement projector lamps and bulbs. We are one of the largest distributors of projector lamps in the world. Holding many thousands of replacement projector lamps in stock, Projector Lamp Experts can deliver the projector lamps you need, and fast. 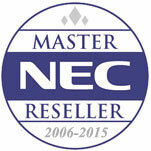 We are focused on the reseller channel, supplying OEM lamps and OEM inside (Original Lamps with Housing) products. 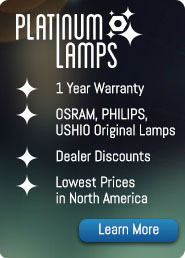 Our popular Original Lamp Inside range is called Platinum Lamps, which feature Osram, Philips and Ushio Bulbs. We are the only company in the US who offer a 1 Year Warranty on Original inside projector lamps. We are also committed to the lowest lamp prices for dealers and resellers in the country through our price guarantee. Projector Lamp Experts is proud to provide its customers with five star service for replacement bulbs, and is able to supply every replacement projector lamp for every model of projector ever made. For advice about buying a new projector lamp for your projector, give Projector Lamp Experts USA a call, toll-free in America, at 1-866-426-5773. Alternatively, our projector lamp advice section provides a full range of up to date information about projector lamp technology that you can browse at your leisure. Why buy your replacement projector lamps from Projector Lamp Experts? Unbeatable prices on replacement projector lamps – guaranteed! Projector Lamp Experts will beat any lower projector lamp price! The Projector Lamp Experts warehouse has huge numbers of replacement projector lamps in stock so most lamp orders can be shipped immediately! Projector Lamp Experts is a key source of replacement projector lamps for Resellers, Distributors, Dealers and Service Centers. We provide discounts on projector lamps for these businesses. If this is your first time visiting the Projector Lamp Experts website – Welcome! Please take some time to visit our registration page to access extended features of the Projector Lamp Experts USA web site such as online FedEx shipment tracking on all lamps, previous projector lamp transaction history, rapid projector lamp ordering and special promotions on replacement lamps.